Luxury ocean liners. Exotic, ornate hotels. A burgeoning, modern society just starting to take shape. Life at the end of Hawaii’s Golden Era (1893-1941) was exciting and progressive—and marked the beginning of mass travel to the islands. To entice even more visitors, many companies enlisted the help of travel ads and posters, many of which became “snapshots” of life in the islands. Using beautiful models and picturesque landscapes to lure would-be travelers, these posters have since become valuable art in their own right. 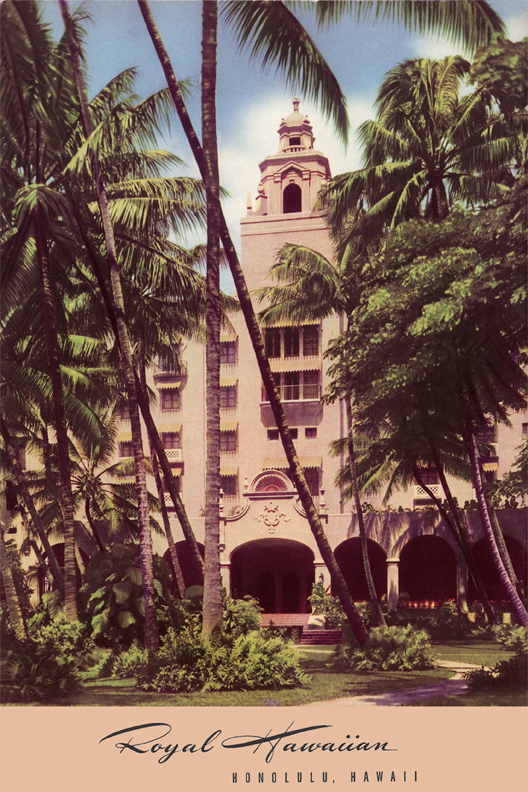 The Royal Hawaiian Hotel during Hawaii's Golden Era. Now, you can see these works of art on display at the Royal Hawaiian, a Luxury Collection Resort, as Matson Navigation shares its rare treasures from its archives in a new exhibit a the Pink Palace of the Pacific. 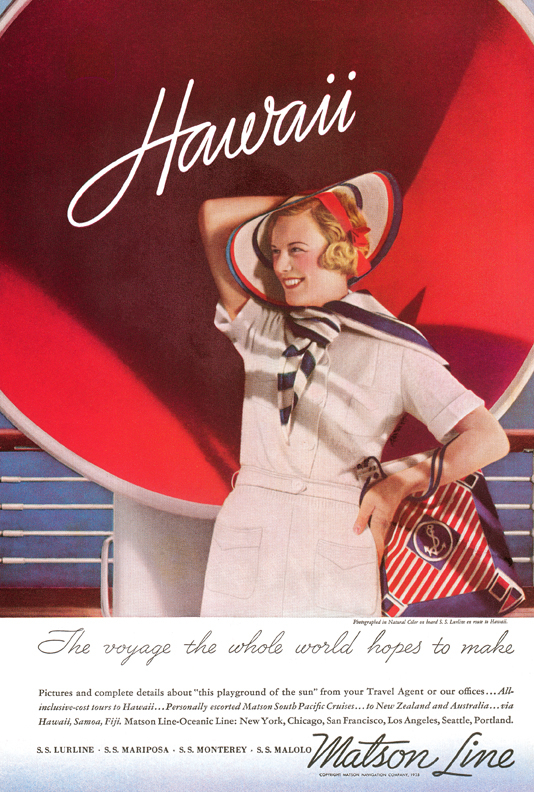 “The Travel to Hawaii Ads Exhibit, a beautiful collection of advertisements from 1935 to 1941” opens to the public on Thursday, August 6 in the Coronet Lounge of the Royal Hawaiian and features a variety of photos from the archives of the Matson Navigation Company. The photos used to make the ads were taken by famous photographers of the time, Anton Bruehl and Edward Steichen. Matson ads appeared in magazines such as Vogue, National Geographic, Sunset, The New Yorker, Holiday, TIME and many more. 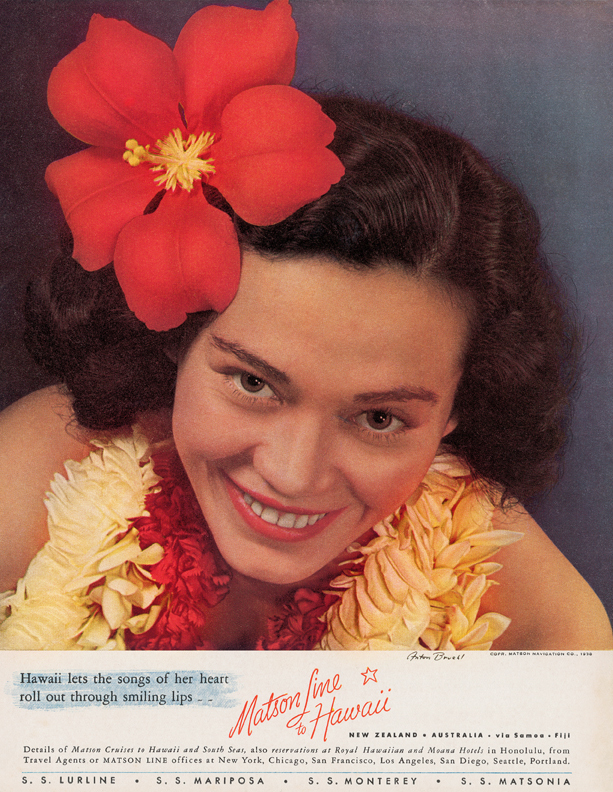 In 1937, a well-known hula dancer named Pualani Mossman became the Matson poster girl. This is the sixth exhibit at The Royal Hawaiian for Matson archivist Lynn Blocker Krantz. The other exhibits included Amelia Earhart in Hawaii, Hollywood’s Golden Age in Waikiki, Boat Days, The Waikiki Beach Boys, and The Vintage Menu Exhibit. Vintage posters give viewers a glimpse of Hawaii as it once was. Matson Navigation Company was instrumental in the development of tourism to Hawaii and the South Pacific. A fleet of Matson Lines cruise ships, the most famous being the S.S. Lurline, traveled from the mainland to Hawaii from the 1920s to 1960s. Matson built The Royal Hawaiian in 1927 so luxury accommodations were both available afloat and ashore. Matson photographers took thousands of snapshots of the celebrities and world-class travelers who traveled on its ships and vacationed in Waikiki. Matson Navigation Company Archives encompass a vast collection of photographs and artwork from Matson Lines passenger and hotel era, 1920s to 1960s. It’s an exhibit you won’t want to miss, especially if you’re a history buff or someone who fantasizes about Hawaii life when the islands were still shrouded in mystery.